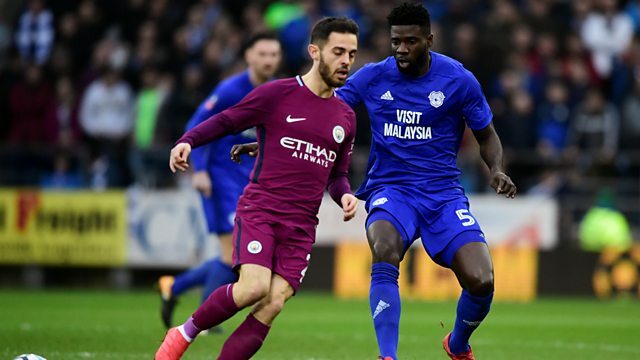 Live coverage of the FA Cup fourth-round game between Cardiff City and Manchester City. Browse content similar to Fourth Round: Cardiff City v Manchester City. Check below for episodes and series from the same categories and more! to upset the odds this afternoon. the streets and Nathan Blake away. moment to change career your life. back then. They were the big boys. But you always get a chance. best goal of my career? Possibly. are stunned by some magic. my career and my life. first time in 17 years. Emirates FA Cup fourth round. making his second appearance today. the 3-2 win against Bristol City. this season for Vincent Kompany. all his goals in all competitions. City but they still look formidable. seem able to do it. they were prior to that. effort put in in training. knows how to motivate team. it's cost me a wed over the years. he's arguing about a corner kick. approach, what do you mean? fantastic motivator and man manager. game. He loves being the underdog. why he still in the job. the dressing room to his players. the individual ability on his day. much that they can this afternoon. Just have to get the ball first. stats are not bad at all. coaches people speaks for itself. what we have to do, it's like chess. the Premier League has ever seen. manager has instilled in us. they do they do really, really well. way because we have another chance. are you looking for from your team? trying to make a lot of passes. they can go where they want. some beautiful football at times. to watch and be a part of. going to be a tough afternoon. I don't think they well. little different to how it is today. bouncing. It was fantastic occasion. so they have got the perfect game. they will want to go direct. game in an attacking sense as well. going right from the kick-off. something like what Newport did. have to learn to chase shadows! Guy Mowbray and Mark Lawrenson. Welsh capital goes well beyond that. Cardiff in 14 visits since 19 54. Does that have any bearing on today? from a back three to a back four. goals between the five upfront. We are all ready to go in Cardiff. of those last seven years. chance to tackle the will tackle. position they will be allowed to. Danilo slow? It was hard to tell. into the gloves of Neil Etheridge. back towards the own goal. top job Neil Warnock is doing. like ugly ducklings isn't it? pop it? What a tease! designated on Kevin De Bruyne watch. reached new levels this season. game to new, dizzying heights. was straight at him. Gundogan again. hurt also looking at it. Stadium was expecting to do that. all jumped. It looks so simple. onto Manchester City a bit more now. don't want to go two down. free kick given against them? Kenneth Zohore, the great big Dane. gone down as well now. Otamendi. not quite sure what to do now. somebody spare every single time. occasionally loan it to you. And who pinched it off him? the way he is retreating. think the wall will be jumping. it will be a Manchester City corner. more with it than that. have a throw in courtesy of Danilo. Richard with the throw. -- Richards. Morrison. Otamendi got it away. now a free kick for Cardiff. first fowl from the Cardiff player. go. Just arching away from bravo. might have been on the end of it. De Bruyne who is always available. for Sterling, Sane takes it up. Etheridge up and away. Danilo. Safely back to Etheridge again. fouled by Paterson who has it now. City. Not a good idea. than any of the City players. pretty much 4-1-5, isn't it? will get one man over at some stage. career. A loan spell at Loftus Road. Gundogan is free again to collect. pretty well so far. But only so far. left foot all the time. an overload with the Bernardo Silva. And his shot! It is not go to count. celebrations will be cut short here. Interesting to see what that is for. going to have a word. way? Otherwise I can't understand. not from the centre circle. Sane. VAR, we don't have it today. pointed to the centre circle. checks and shoots and Izzy offside? City 0- one Manchester City. to say offside. Here is De Bruyne. away as far as De Bruyne. Walker. Sterling. His shot is high. refereeing system is in use or not. in the Chelsea and Newcastle game? more you get used to it. -- are still only 1-0. Sterling. Calmly done by Morrison. Kompany has made that look simple. a word with the Cardiff winger. All is calm again but brooding. think the head is on fire. the two men in the technical areas. Walker. Silva. Sane, De Bruyne. it will be a Cardiff throw in. 's cup and alongside him. gone six games since he last scored. putting it into the back of the net. what do you do is the opposition? kill you with one pass all the time. than a corner for Cardiff City. defending with the high line. Walking pace. A stroll in the park. It's just a masterclass isn't it? Fernandinho has lost the ball. for Cardiff. No Hoilett. Gundogan. Silva to the right. Here is Sane. Was at a cross or a shot? Either or the break again was great. start, not that he needed it. Bravo. more at Manchester City now? need to get the ball first. Paterson's throw could bring reward. he's about to get into the box. awareness from De Bruyne, on you go. I tell you what, that is a red card. Obviously the referee never saw it. His studs plaited into him. sensational. Very good to watch. free inside the six box. two years I think. Very good. in. Just a couple of inches. It's a hell of a strike. line with the goalkeeper I presume. Yeah but as I saw he's not. situation I am all for it. like he might have rolled his ankle. to go and hear drier the players. Manchester City have been fantastic. Alonso. Good save. Look at this. has made a run ahead of him. football coming up on the BBC. hero from 1994. Nathan Blake. to see in second half? what's going on in the Championship? the pace they have upfront. they go forward, Manchester City. central, he want about wide. which is sad in itself. maturity and patience in his game. 75-80% which is good for him. with De Bruyne finding Kompany. the start of the second half. Walker gave them the ball. the left basically. At the moment. pass too many and cleared by Manga. Kevin De Bruyne. -- Manchester City. been given the ball back. face that was the ultimate problem. bit further back in the field. 15 years ago. They lost to Arsenal. potential of them winning the lot? as well, when they win the league. Arsenal are gone from the FA Cup. it three and killing the tie. but he took it well. bounced through to Paterson. Ralls. Grujic. Given away to Sterling. It seemed that way. Bennett. got enough on it for Claudio Bravo. perhaps a little too keenly. Otamendi is sent spiralling down. never clattered into anyone, has he? free kick for Manchester City. little bit -- Manchester City fans. Can the Cardiff team respond? don't want to be embarrassed. with it if he wants. want constant pressure on the ball. have earned the right to do so. Cardiff have a free kick. and a full Cardiff City Stadium. Hoilett. He has gone for it! between them. More than a little. De Bruyne's corner. Bernardo Silva. it. It will be Mendez-Laing again. efforts of Gundogan to get there. given us in the last ten minutes? vision. Just marvellous isn't it? Guardiola's work at Manchester City. game. For more end product. yellow card for Ecuele Manga. bad was this on Sergio Aguero? they have through the squad. stadium yet? What was that? position he has got everything. tenth season with Manchester City. 323 appearances for the club. Kompany. Sterling beaten by Kenedy. not suggested it would have. him. Great run from Walker's well. outstretched as if to say "Why?" the way they have played. at the top are bigger squads anyway. yet or if there is one left in them? not give him the ball. now. Going to get another one. City going to make another change. known. Brahim Diaz coming on. Brahim Diaz, his sixth appearance. the FA Cup this season. That is not him is it? someone after a tackle like that? it's justice but it's justice is it? short for a word with the officials. made in terms of his foot. weird. But the tactics were class. the game, we know all the details. minutes with some meaty challenges. and hopefully it's not too bad. come out and they lose them. over. It is if the jump! everything as well. This ball here. but there was no organisation. opportunity in the first half. chance they were going to get. fantastic and deserved the results. Premier League is almost done. team that looks the most capable. your team visit the website. I have put my team and! from all of us, a very good buy. going to count, the flag is up.